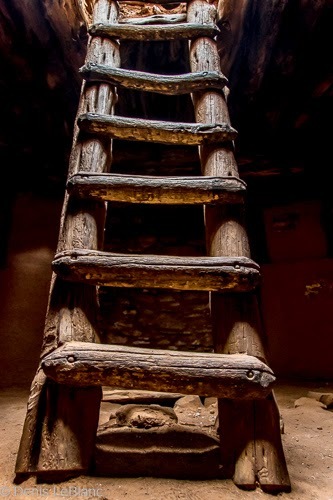 I have followed Gary Hart for years, admiring his photography and wishing I could justify the cost of taking a photo workshop from him. When I received an email from Gary last summer about a photo workshop trip rafting the Colorado with him, we jumped on it right away. Good thing, because it filled up by the next day! 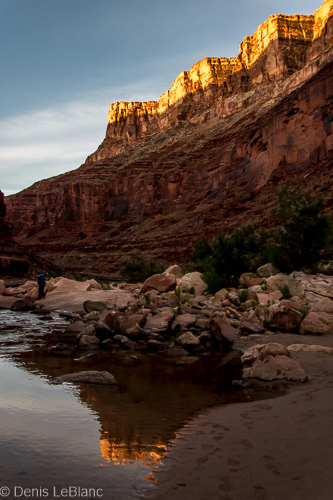 So for months we have been anticipating and planning around a week on the Colorado in May. 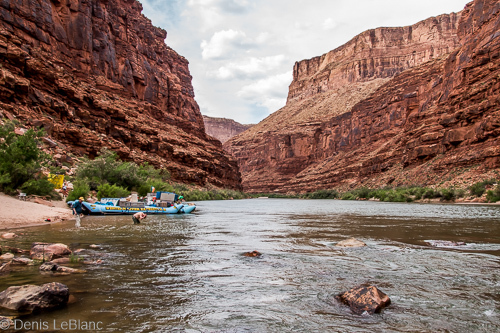 We have done river trips before, but this was the Colorado--the granddaddy of all whitewater trips in the country--and a major bucket-list item for both of us. The fact that it would be photography-oriented was just icing on the cake! After the long and arduous trains/planes/automobiles journey to the put-in place on the river, we were briefed (the first of many chapters) on packing and life on the rafts. We were given one last chance to back out as this was a one-way highway with no off ramps for 188 miles! All in all, we spent six days and five nights on the river in the hands of very experienced and capable guides. We ran huge rapids with standing waves as high as our boat was long and we all got completely soaked over and over again in the very chilly 50-degree water. 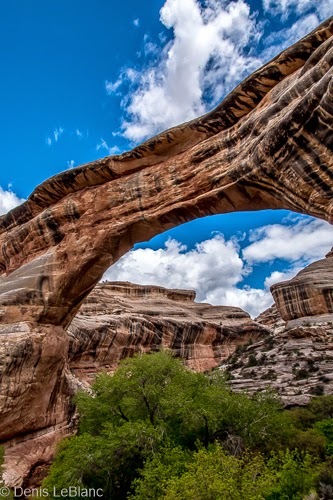 We hiked up side canyons and saw gorgeous waterfalls, ancient Indian ruins, slot canyons, streams with water the blue-green color of a swimming pool and caverns as large as a symphony hall. We had fabulous meals and slept on fine-sand beaches and fought rain, wind, blowing sand. 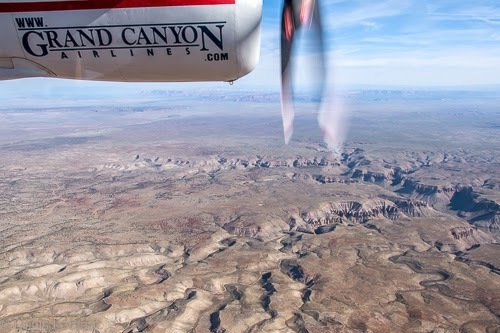 We cruised past what seemed like hundreds of side canyons and under walls nearly a mile overhead. We saw rocks over 2 billion years old and we learned to pee in the river (because L.A. needs the water, as our guides told us!). I have more pictures to post than I can fit in this blog post, so I will be making a few more posts, but here is a sampling of what we experienced on this trip. I will also hopefully post some shots and videos that other people took on the trip, so keep checking back every few days. We bathed in the river at the end of the day--very chilly but refreshing! 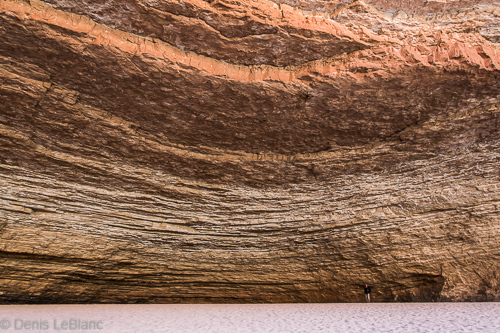 Redwall Cavern. John Wesley Powell thought it could hold 50,000 people! We had two rafts in our expedition, each holding 14 people. Here is a shot of our sister boat. 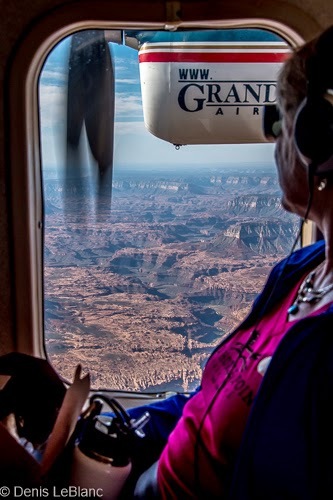 For over 3 months we have been dancing around the Grand Canyon. We left California in early February and crossed the Colorado River at Yuma, then camped at Lake Havasu in March just upstream from Yuma. 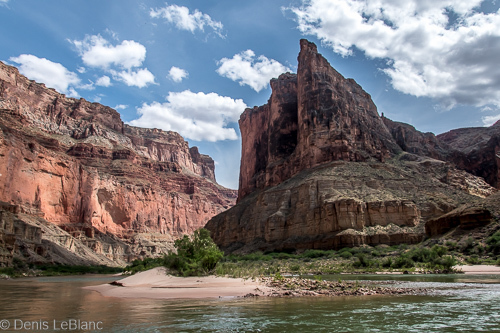 We crossed the Virgin River (which flows into the Colorado just downstream from the end of the Grand Canyon) repeatedly in Zion in late March. 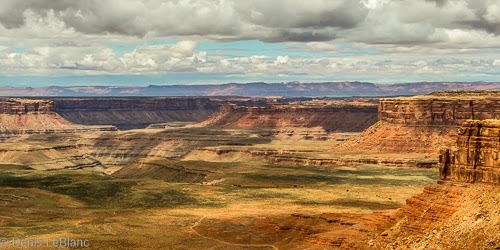 We looked at the Colorado (and the Green, which joins forces with it just above Lake Powell) from 2,000 feet above at Dead Horse Point in April. 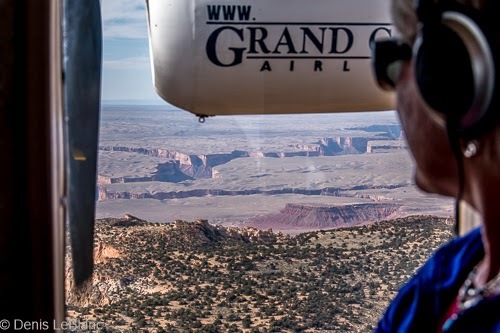 We saw the San Juan River, which also joins with the Colorado above the Glen Canyon Dam, from high above on Muley Point in late April and crossed it a few days later at the very beginning of Lake Powell. 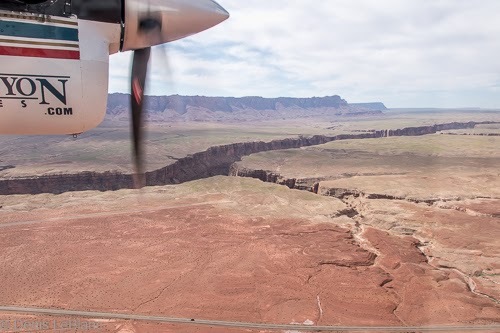 Finally boarding a tiny plane on May 12, we flew across the Grand Staircase from Las Vegas to Lees Ferry, 15 miles below the Glen Canyon Dam, where we would begin an epic adventure--rafting the Grand Canyon of the Colorado. 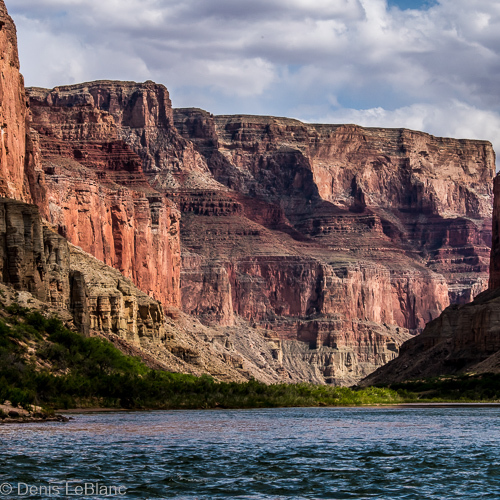 The Colorado River is epic in many dimensions. 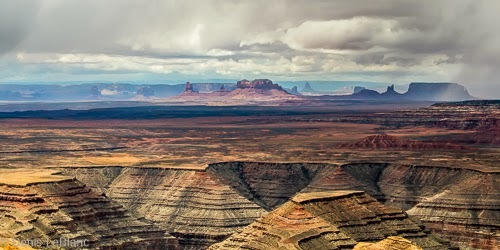 As measured by the combination of length, vertical drop and volume of water, there is no river in the world to match it. 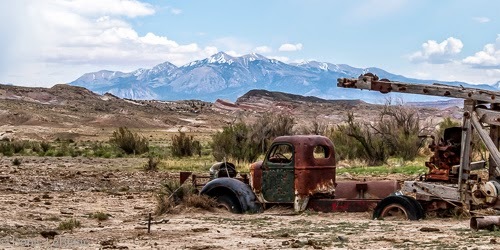 It starts at 14,000 feet in the Colorado Rockies and ends with a whimper in the desert of Baja California--never reaching the ocean--after supporting tens of millions of people with food, water, recreation and electricity on its way. 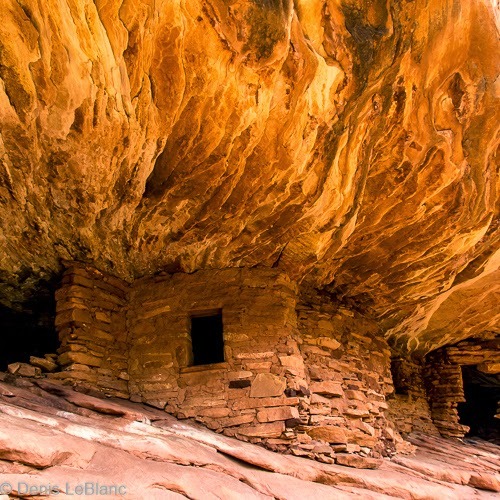 The Grand Canyon was "discovered" by the Spanish in 1540, but their Hopi guides already knew it was there. 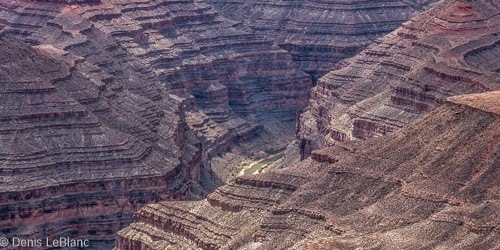 It would not be explored for over 300 years more, when Major John Wesley Powell led a small expedition in 1869 into the unknown, because people literally did not know what was down there. 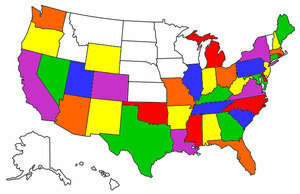 They knew some rivers went in and one came out, but the entire 300-mile area was a blank spot on the map. Fittingly, today is the anniversary of the launching of the Powell expedition 146 years ago. Powells small crew nearly died, but by the time they came out 3 months later, they knew that there weren't huge waterfalls or whirlpools or giant grizzly bears (all suppositions at the time). 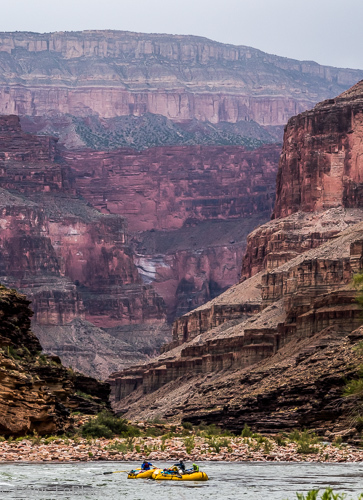 Over the next 80 years, only about 100 people would travel through the Grand Canyon. 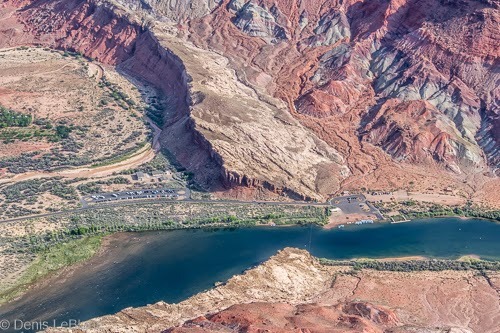 It became a national park in 1918 and in 1963, the Glen Canyon dam forever blocked the free flow from upstream and the amount of water flowing through the Grand Canyon became dependent on how much electricity was needed in Las Vegas and Phoenix. 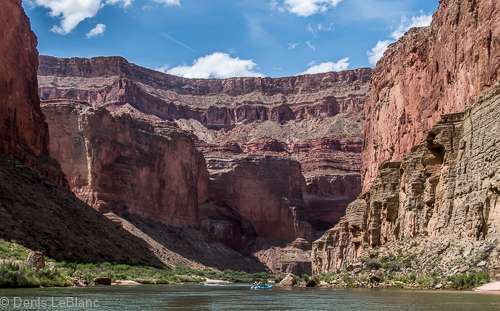 Some attempts were made to erect dams inside the canyon, but failed as the country came to realize what a treasure the canyon was. 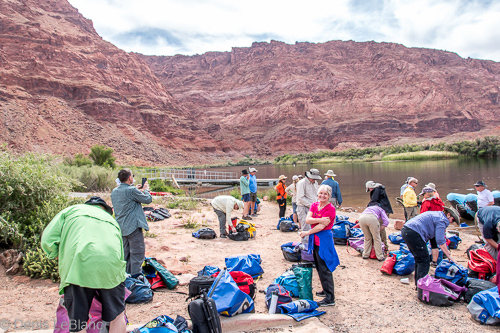 Our trip began in Las Vegas, boarding a bus at our hotel at 5 AM, then a tiny plane in Boulder City Nevada to the Marble Canyon airstrip, then another bus to the put-in place on the river at Lees Ferry (Mile 1). We wouldn't get on the river until about 10 AM. 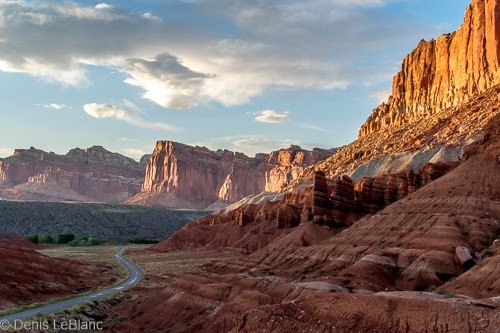 The state of Utah has been promoting tourism in the state with its "Mighty 5" program to encourage travel to its five national parks. 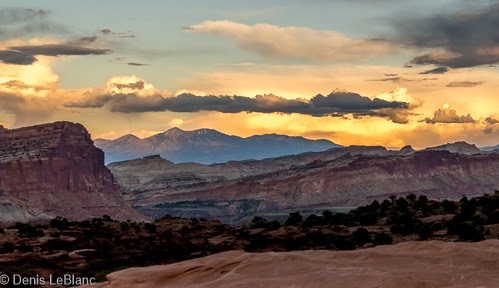 Most people have heard of Zion and Bryce, maybe Canyonlands and Arches, but the least-known park has to be Capitol Reef. 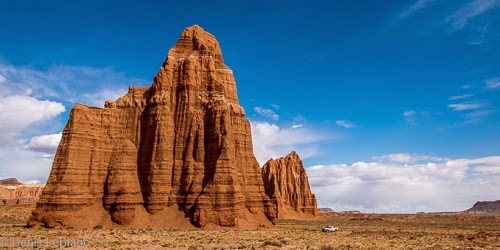 It doesn't have iconic images like the Delicate Arch or the amphitheater at Bryce, so maybe people don't really know what is there, but we were blown away at the beauty, isolation and geological wonders of the park. 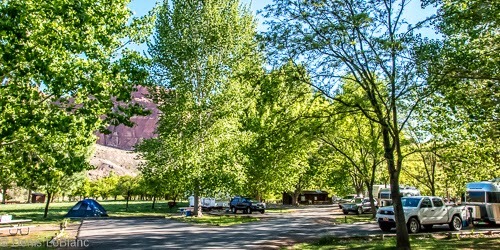 Plus it has one of the nicest national park campgrounds that we've had the pleasure to call home. 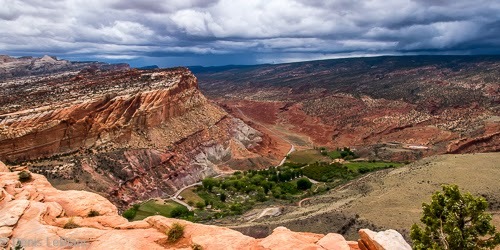 Capitol Reef is about 100 miles long and runs north-south. 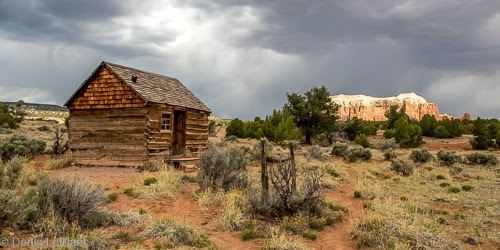 It is bisected at its waist by the only paved road through the park, UT-24. 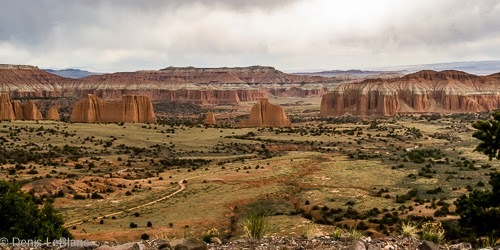 Much of the area is only accessible by trail or 4WD road. 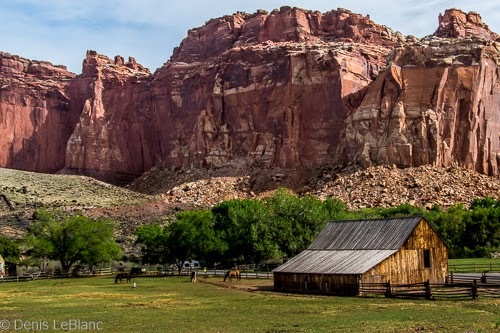 There is much to see right around the campground and visitors center, which is located in an old Mormon settlement called Fruita. 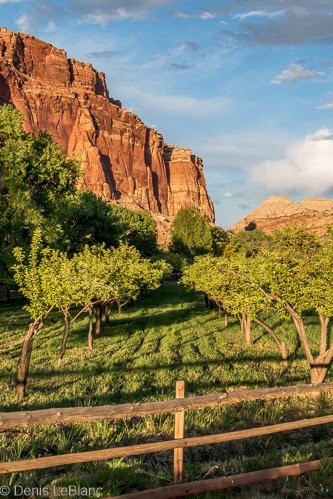 It still has over 3,000 old fruit trees planted nearly 100 years ago and which, along with the huge cottonwood trees, forms an oasis in the dry high desert of south-central Utah. 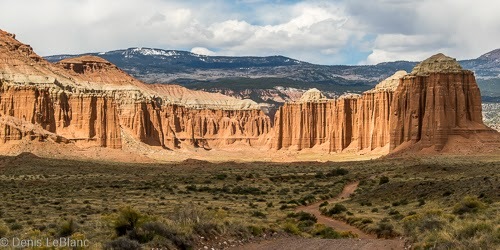 The main geological feature of the park is the Waterpocket Fold, a 100-mile-long anticline (fault in the earth) that creates dramatic cliffs on the west side. 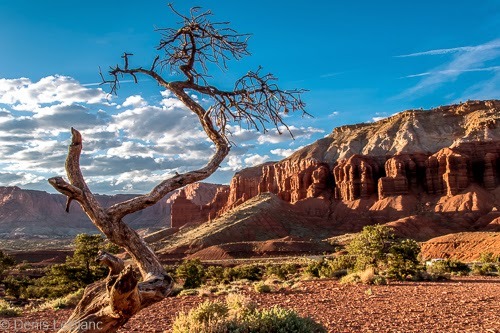 Feeling adventurous, we decided to take the backcounty loop to Cathedral Valley, one of the most beautiful and remote sections of the park. 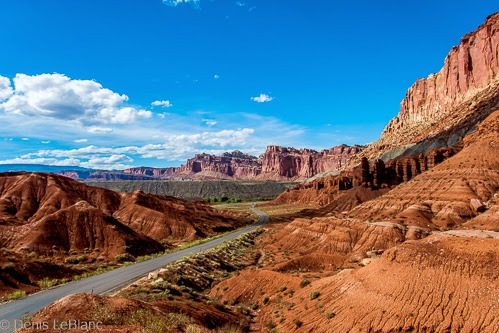 The roads are composed of bentonite clay, which forms a sticky/slippery goo when wet, so any significant rainfall makes them impassable to any vehicles. We were warned that we could be stranded out there, possibly for days. But the forecast was calling for scattered showers, nothing to heavy, so we decided to chance it. With a full tank of fuel, extra food, water and clothes and good maps, the three of us headed off to an 8-hour drive through some of the most remote and beautiful country we've seen. We made it back fine and are really glad we went there. 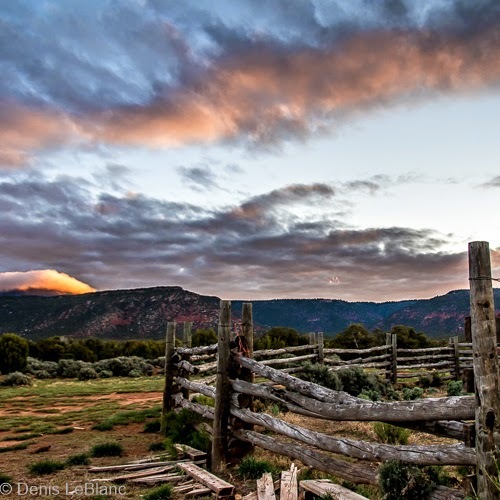 Cedar Mesa is an area in southeastern Utah near the four corners that covers 400 square miles and is nearly uninhabited. 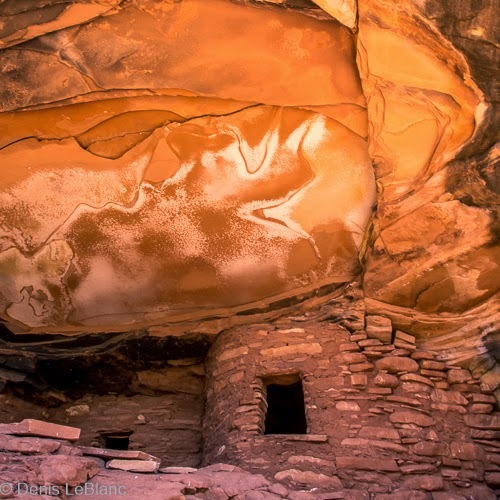 It was a population center for the ancient Puebloan people who disappeared about 900 years ago and left thousands of artifacts and dwellings scattered in the rugged and isolated canyons of the mesa. It is a very scenic area and a lot of fun to explore the ruins. 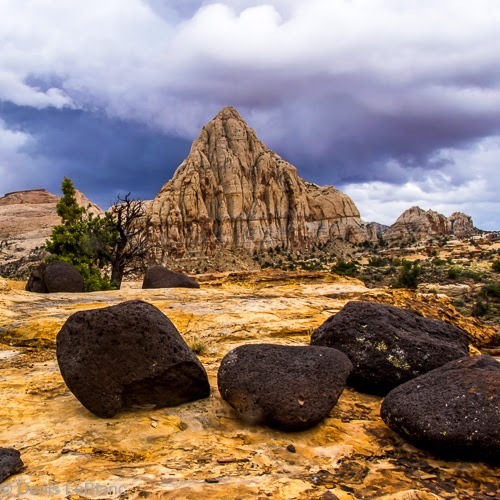 Not as well-known as the major national parks of Utah, Cedar Mesa is not crowded and evokes a sense of timelessness and wonder. 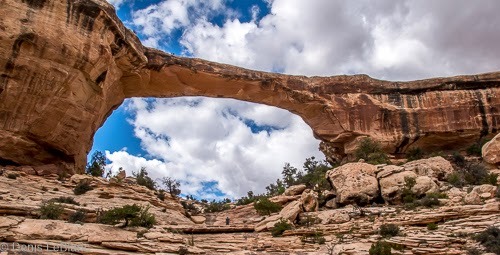 We planned to spend about five days here, but were not able to fit our trailer into the one campground in the area at Natural Bridges National Monument. 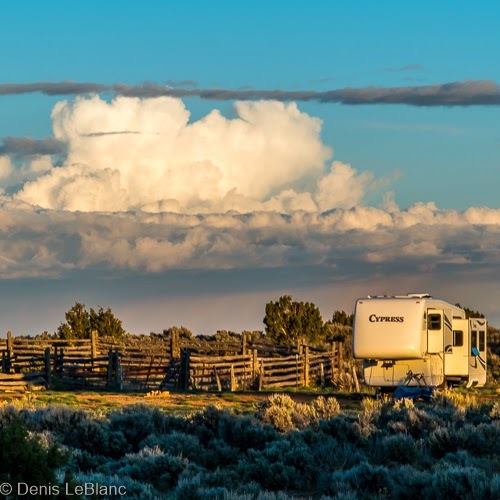 Much of the land is managed by the Bureau of Land Management (BLM) and they allow dispersed camping in many places, so we found a nice meadow that looked like it was used as a cattle camp and put down roots. We were the only people here (except for one camper one night) for the five days of our stay. We explored many places in the area and left feeling like there was much we still would like to see. 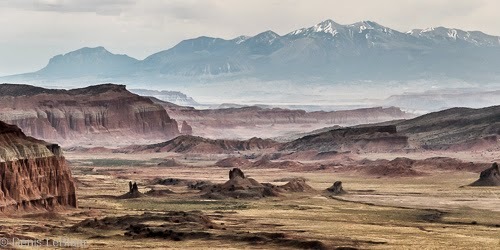 Like many parts of Utah, we really hope to come back again someday. 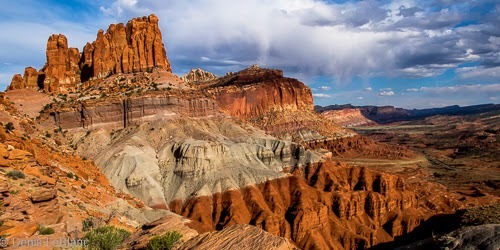 Some of the highlights were the ruins in Mule Canyon and Road Canyon, the overlook at Muley Point and Natural Bridges National Monument.